Twenty years ago, my husband and I made one of the most difficult decisions of our married life: we decided to leave a church and to worship elsewhere. Leaving behind dear people we loved (and likely offending more than one person in the process), we left that fellowship convinced that God was telling us it was time to let go. Soon, our roots were planted deeply in the good soil of another church family. They welcomed us with warmth and enthusiasm and the years have flown. The church with the white steeple and the red doors is home to us and to our sons, but, quite honestly, there have been seasons when it was not a joy to be there–hard seasons of pastoral searches, dry spells when nothing seemed to click, frustrating years when I would scan the horizon for a sign–sky writing, a whisper from the Word, ANYTHING that would release us and give us a green light to let go. I was tired of holding on, but the clear assignment from God was to do that very thing, and I’m thankful now that we did. In It’s All Under Control: A Journey of Letting Go, Hanging On, and Finding a Peace You Almost Forgot Was Possible , Jennifer Dukes Lee devotes two full chapters and a lot of wisdom to the tightrope walk of hanging on and letting go. It turns out that “Let Go and Let God” may not be the best advice all the time, but there are also times when letting go is a true mark of bravery. It was good news to hear that “gospel living is not an either/or question. It’s both/and. It’s coming back to that fork in the road every day–with every decision, every obligation, and every relationship–and asking God to help you choose.” (77) This is a recipe for living surrendered, and it comes back to persevering through the hard work, believing through the messy middle, and practicing the spiritual discipline of active trust. “Just because something is hard work, doesn’t mean it’s wrong or should be abandoned.” (85) God may call you to write a book, start a new career, or to persevere through a hard season with a needy friend. It is also likely that at some point you will be called into the hard work of letting go, of opening your hands to release grown children, to relinquish a project that has gone off the rails or a task that is not yours to do. The privilege and the challenge of this following life is living close to Truth so when God’s voice comes, our ears are accustomed to its pitch and timbre, and our hearts are in good shape for the hard work of obedience. Many thanks to Tyndale House Publishers for providing a copy of this book to facilitate my review, which, of course, is offered freely and with honesty. Back in 2016, Jennifer Dukes Lee released The Happiness Dare in which she lays down the challenge to overcome obstacles to happiness with truth that jumps into our hole of unhappiness and builds a ladder toward the light. To the defeatist notion that “This is just the way I am,” she offers the happiness booster that “little by little, I can become happier by changing the way I think.” The truth of Romans 12:2 is nowhere more practical than in the “renewal” that takes place when the believer alters her thoughts toward happiness. 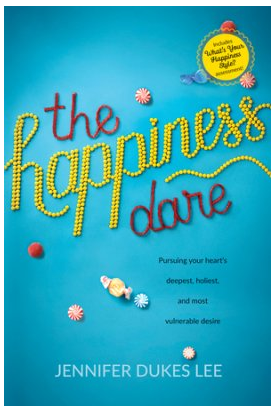 I invite you to check out my review of The Happiness Dare here. I am a participant in the Amazon Services LLC Associates Program, an affiliate advertising program designed to provide a means for sites to earn advertising fees by advertising and linking to Amazon.com. If you should decide to purchase It’s All Under Control: A Journey of Letting Go, Hanging On, and Finding a Peace You Almost Forgot Was Possible , simply click on the title here or within the text, and you’ll be taken directly to Amazon. If you decide to buy, I’ll make a small commission at no extra cost to you.